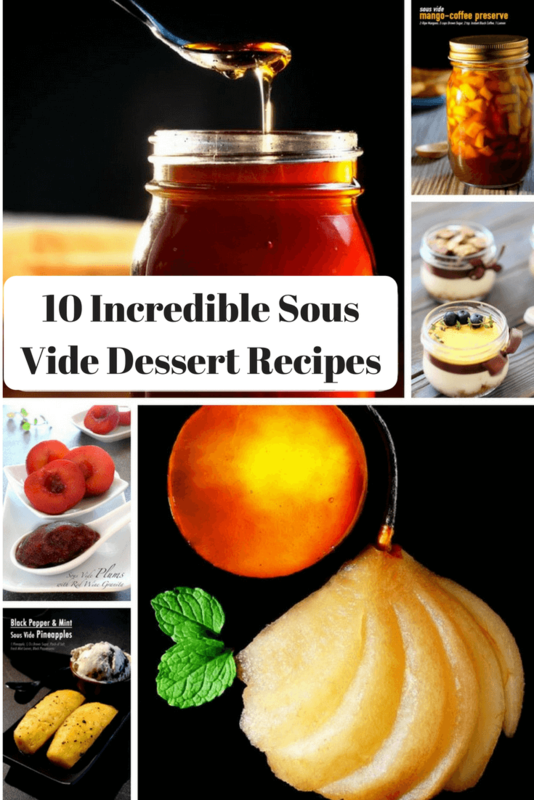 10 Incredible Sous Vide Dessert Recipes , it's a pretty badass tool (and company). You can rock sous vide from your smartphone app, and even control it with your voice using Alexa. This makes it convenient to start cooking while you've got sticky sweet hands, or even start your sous vide device while away from the home. It's a great way to go out for a day of shopping, and come back to a treat when you get home. Sometimes I'll set an alarm for 6AM on Sunday to turn on my sous vide, and wake up to perfectly cooked eggs. Yogurt works at any time of the day, including for breakfast or for dessert. But, if you’re going to have it, why not make your own? 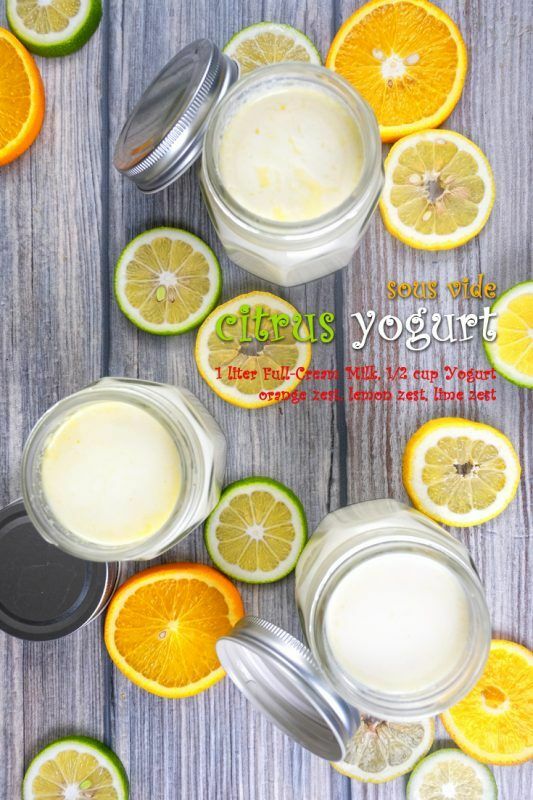 This Citrus Yogurt is one way of doing this and you’re using both yogurt and full-cream milk as the base. The end result has a much more interesting flavor than regular yogurt, without any of the added sugar that you typically see. This is also an incredibly flexible recipe. For example, you can easily change the flavoring ingredients that you put in and just about anything will work. Doing so would let you make berry yogurt, savory yogurt or anything else that you can imagine. Additionally, you can strain the yogurt once it is done, which will give you a texture that’s similar to Greek yogurt. The only downside is that you mightn’t want to go back to store-bought yogurt afterward. 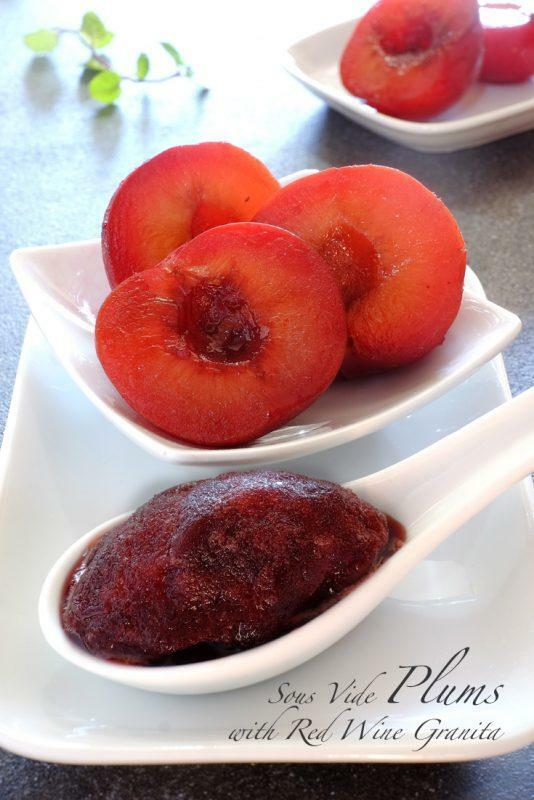 These Sous Vide Plums with Red Wine Granita make for a very simple dessert but a powerful one. One fun aspect is that you’re making the red wine granita at the same time as the plums, which just adds to the simplicity of the whole dish. Personally, I love the way this one turns out, even though I’m not normally a fan of plums. The finished dish also looks stunning, making it a good dessert to serve for company. The most classic sous vide dessert would have to be crème brûlée and this Blueberry and Saffron Crème Brûlée is my own version of that idea. 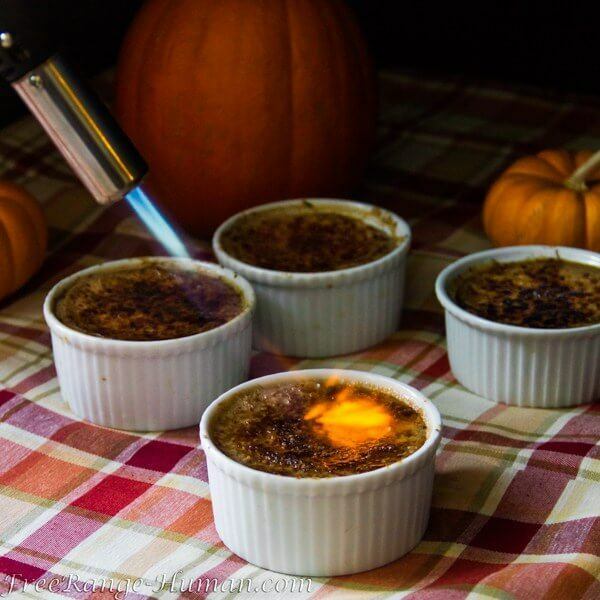 The recipe itself shows you everything you need to make crème brûlée in the sous vide, along with one flavor combination that I particularly love. But, you’re not limited to blueberry and saffron as ingredients. Instead, you could add in your own choices based on what you have at hand and the flavors that you like. Crème brûlée does turn out amazing with sous vide, so you can use just about any flavor combination that you can imagine and it should still turn out perfect. These Black Pepper and Mint Sous Vide Pineapples are a more unusual dessert choice but that doesn’t make them any less appealing. You can use sous vide for most fruits that are fairly sturdy and pineapples tend to turn out exceptionally well. 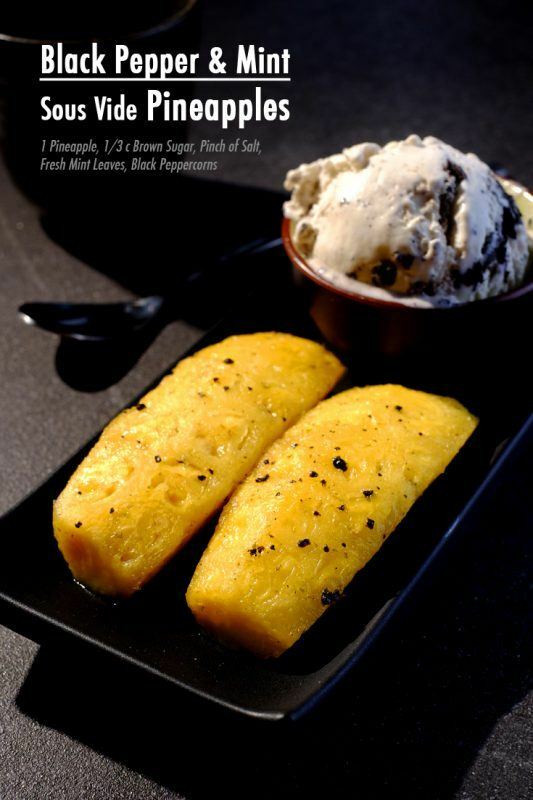 I was particularly impressed with how the flavors paired in this recipe, as the black pepper and mint make a nice contrast to the traditional sweetness of pineapple. Of course, you can also play around with flavors to find your own combination. I do this often myself and rarely make a recipe the same way twice. This recipe from seriouseats.com is a little different than the rest. Basically, the post is a guide to making the best apple pie possible, using either the stovetop or sous vide. The idea here is to have an interior that is more gooey than normal and actually stays in place when you slice it. The advantage of the idea is a pie that is much easier to serve and less messy overall. 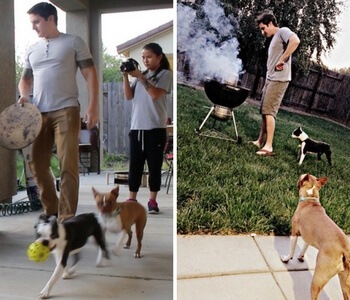 Doing so involves some slightly different approaches, which is what the recipe focuses on. The end result is seriously impressive. 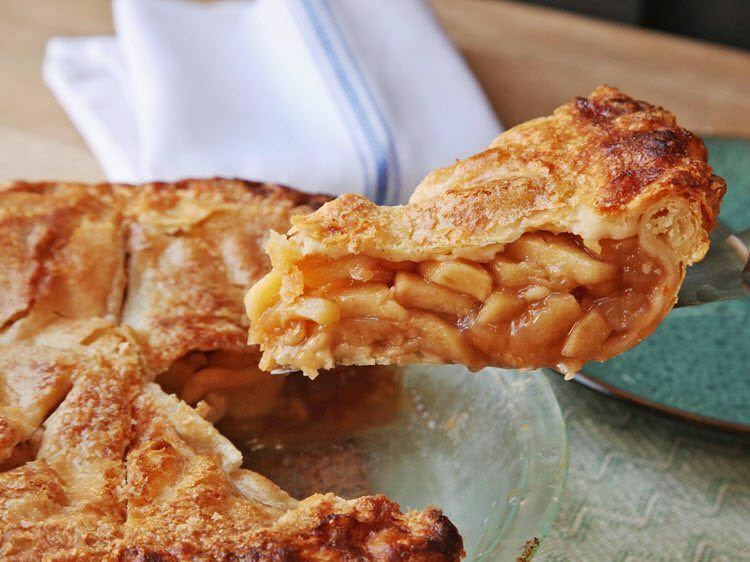 Honestly, the recipe is one that I’d like to try myself, especially for my family members that love apple pie. Like the pineapples from before, these Ginger Tea Sous Vide Pears with Spiced Jelly are a good example of fruit made in the sous vide. The flavor combination here works extremely well, with just the right amount of fragrance and complexity. The dessert itself also looks very elegant, which is a bonus. 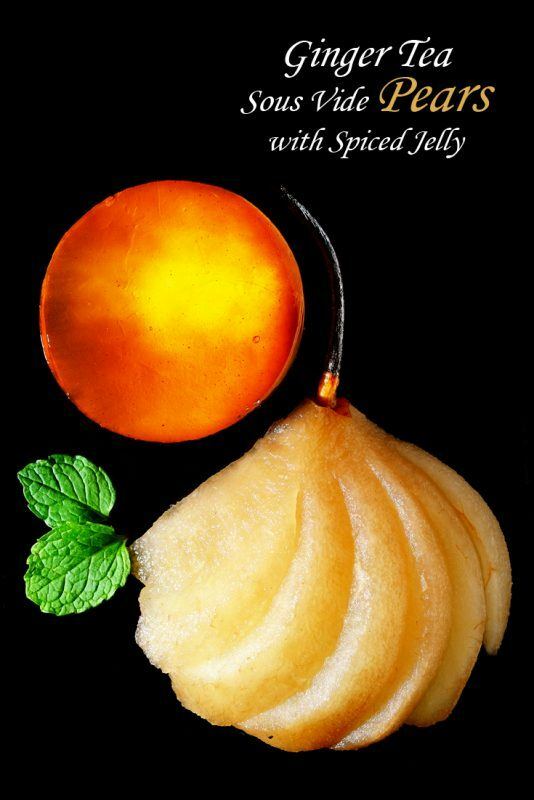 On a side note, the recipe makes a much more practical way of poaching pears. In most other cases, you need a significant amount of poaching liquid. Working with sous vide cuts down the liquid you have to use. That’s perfect if you just plan on cooking for one or two, or if you simply don’t like waste. 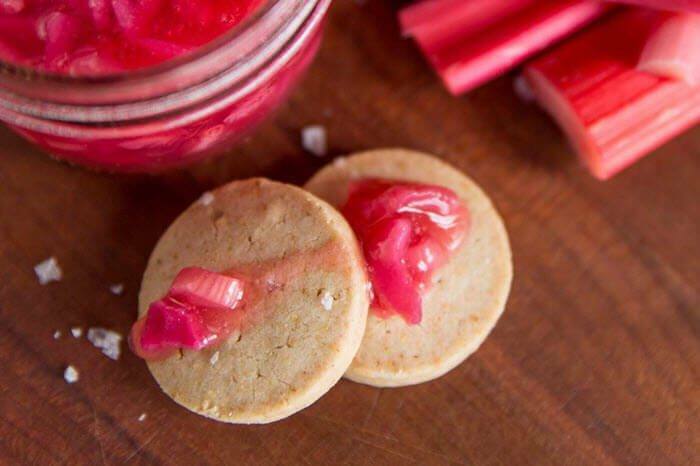 This Sous Vide Rhubarb Jam recipe comes www.chefsteps.com and it works well as a dessert, a gift or even as part of breakfast. Rhubarb jam takes advantage of that sweet and tart flavor that rhubarb offers, without being overwhelming in either area. You’re not limited to rhubarb either. Instead, the same general principles apply to any other type of jam that you want to make. Does the name ChefSteps sound familiar? That's because their immersion circulator, the Joule, is rated #1 among all my tested sous vide devices. 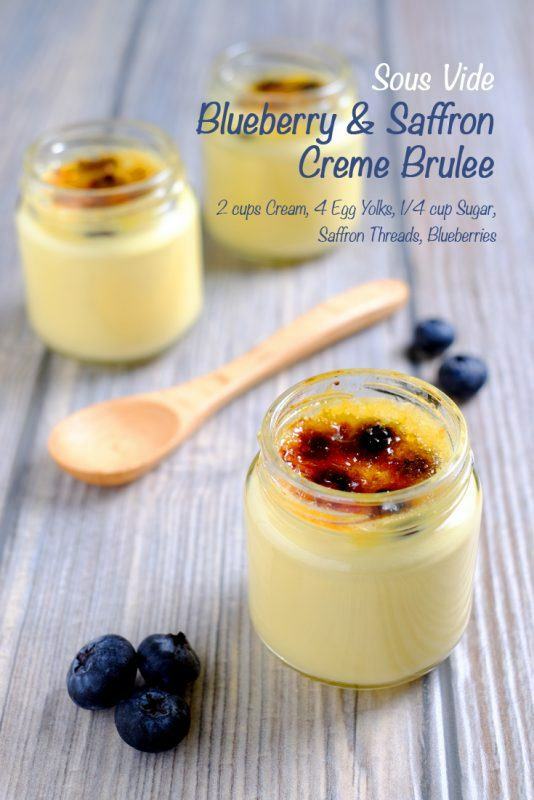 I mentioned crème brûlée earlier and this recipe from pasturedkitchen.com is another flavor combination that you could consider. The recipe here was written with fall in mind but you could easily make it in the warmer months as well. Either way, the choice of ingredients here is simply exceptional and this is another option if you enjoy crème brûlée. 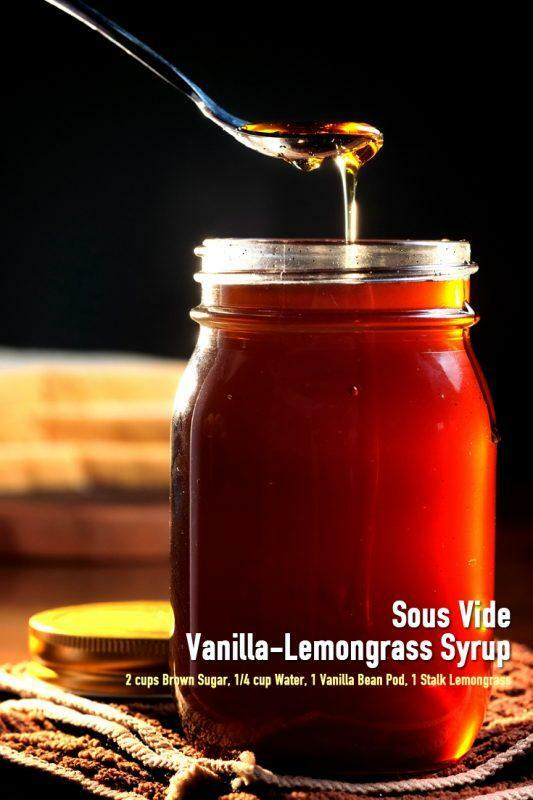 This Vanilla-Lemongrass Syrup may not be a dessert in its own right but it makes a perfect addition to many different desserts. The sous vide works exceptionally well for recipes like this, creating an intense flavor that is hard to beat. At the same time, infusions via sous vide are much faster than a cold alternative, making them extremely practical. I can imagine this syrup on anything that traditionally uses maple syrup, such as pancakes. For that matter, it would also work well over ice cream or a banana split – the choice is yours. One of the most interesting aspects of the sous vide has to be the ability to make infusions and create more intense flavors overall. 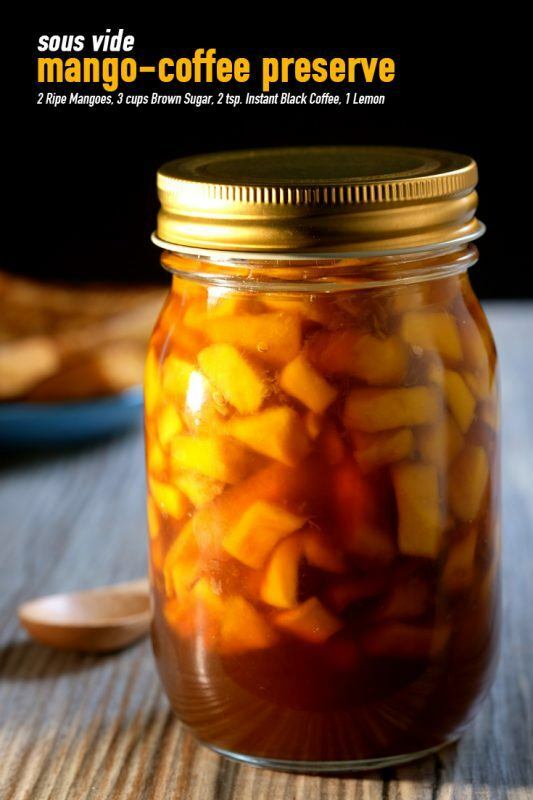 Many of the desserts on this list take advantage of that fact and this Mango-Coffee Preserve is another example. As the name implies, the key flavors that you’re using here are mango and coffee. That may sound like a strange combination but trust me, it works well. The finished product would also make a good gift for anybody who loves preserves. For that matter, this type of preserve can easily last more than a year if sealed properly. So, why not try it out?